Successfully Added Multi-Media HDD Player and Enclosure to your Shopping Cart. If you're into music and movies on the go then check out The Multi-Media HDD Player and Enclosure. Portable, powerful, and well-priced! Portable: Designed for true portability, The CVS-HDD15 perfectly balances size with capacity. It's a slim and compact 2.5 inch SATA enclosure for hard disk drive capacities up to 500 GB! With that kind of storage you could fit the entire Beatles collection and all 20+ seasons of The Simpsons in there and still have room left over for your favorite movies! Powerful: Not only is The Multi-Media HDD Player and Enclosure truly portable, it's pretty powerful too! Aside from being a HDD enclosure, it also accepts media input from SD cards and USB flash drives. It effortlessly plays the web's hottest audio and video formats like: MPEG1, MPG, DAT, MPEG2, VOB, MPEG4, DIVX, XVID, MP4 , AVI, MP3, CD, WMA, WAV, and JPEG! And Well-Priced: Sure there are cheaper HDD media players out there, but that's exactly what they are: cheap, cheap, cheap! Constructed from anodized aluminum, The Multi-Media HDD Player and Enclosure is an inexpensive and rugged solution to media portability. Picture this: You've saved all five seasons of Miami Vice in the CVS-HDD15. Absent-mindedly, you leave it on your bed. Your fat friend Freddie who's five hundred pounds comes over and plops down on your bed! Not to worry, it's a CVS-HDD15. Press play, and there in living color is your favorite show! 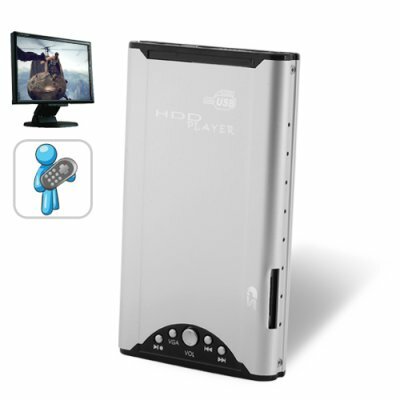 The Multi-Media HDD Player and Enclosure is plug-and-play ready and in stock now. Available in single piece or bulk orders, buy one to see how great it is and then buy a bunch for your online store. We can even dropship directly to your customers and they'll think it came from you. Chinavasion - the online leaders in direct from China wholesale electronics. HDD Enclosure and Multimedia Player in one! Does The CVS-HDD15 play XVID AVI files? Does Megan Fox look like her last name? Yes, The CVS-HDD15 plays the web's most popular file format - AVI files with the XVID codec. From 1-10, if 1 is like chewing gum and 10 is like building a space ship, operating the CVS-HDD15 is a 3. Unscrew the case (screwdriver provided), attach SATA cables to your HDD, close the case, begin using. In fact, deciding what to watch on your CVS-HDD15 will be more difficult than operating The CVS-HDD15. This is wonderful little media player! I put in a 320GB hdd and dumped all my movies in there! it works great. A better manual would nice though.